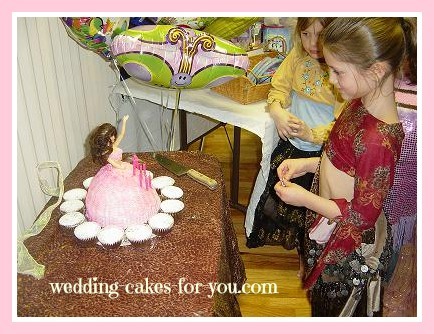 Barbie Princess cakes, Mermaids and even Bellydancer cakes are perfect for little girls and adult parties! The tutorials below take you through all the steps for making one of these adorable centerpieces. 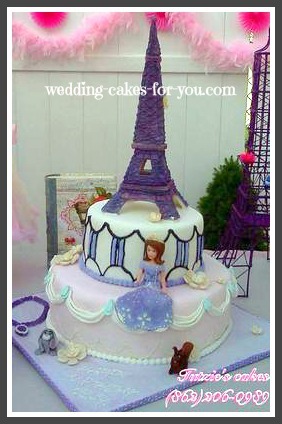 Do you have princess cakes that you would like to showcase? We would love to see and hear all about them. Go directly to the form ﻿below ﻿to submit your beautiful designs. 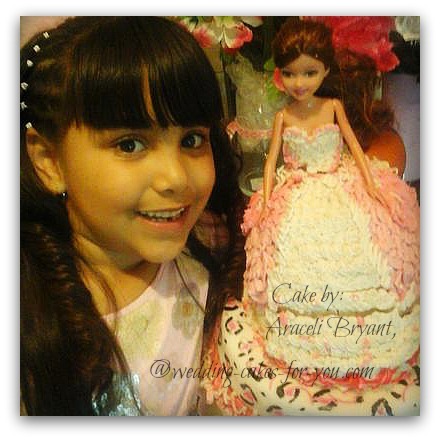 In the video I take you through making a doll cake using a full sized Barbie. The birthday girl chose marble cake. Use my delicious buttermilk chocolate recipe and pair it with a simple white cake, swirled together, filled with chocolate fudge and finished off with American style buttercream. Evynn's birthday surprise (below to the right) was celebrated at The Maritime Aquarium in Norwalk Connecticut. 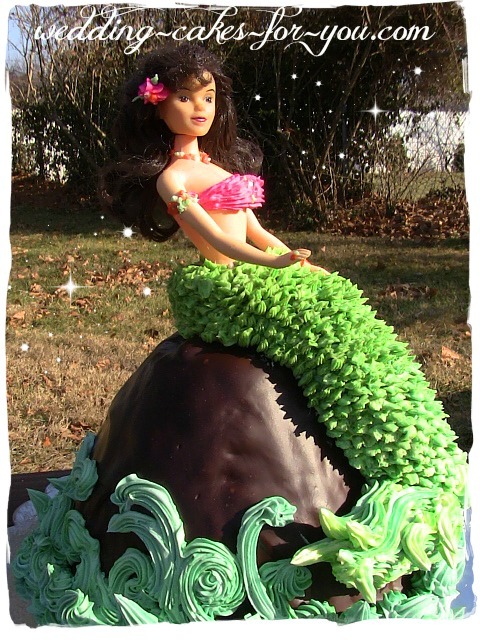 It was the perfect opportunity to create another Mermaid / Princess cake and a great place for a birthday party for kids. 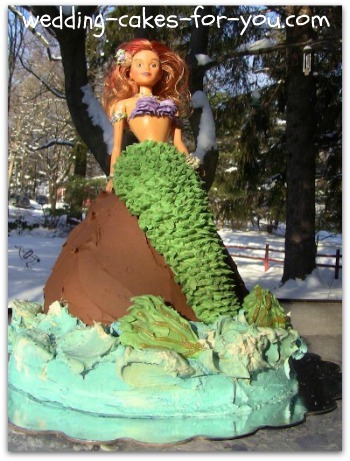 For the mermaid you can use the Wilton Teen Doll Pick and the Wilton Wonder Mold Pan to create the rock. Pieces of cake are then molded into a tail and piped over with tiny scales using a small Chrysanthemum tip. You could use a small rose tip as well for this. TIP: You can also use cupcakes to mold the tail with as I do in the video below. 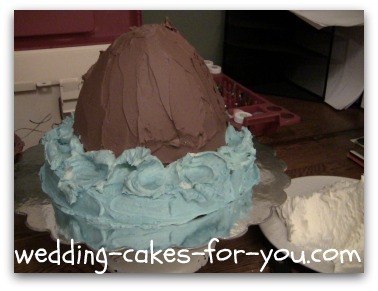 Chocolate ganache makes a gorgeous rock or use chocolate buttercream (shown in the video below). The swirling waves really pop with a rich dark background. 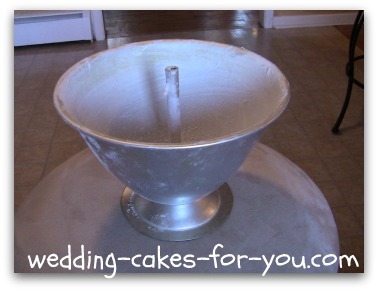 This video takes you step-by-step from the baking all the way through to the finish. It is one of the first videos I made for my YouTube channel. Below the video are the pictures laid out for you with steps. 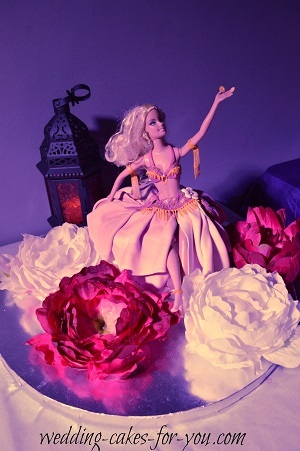 What better way to celebrate a bellydancer's birthday than a beautiful bellydancer doll cake. The design was inspired by the Ipoh bakeries fashion doll creations. Instead of walking the runway, she was seated on a delectable carrot cake with her skirt flowing around it. If you look closely you will see tiny finger cymbals. Three lovely dancers from the Bellydance Cafe party. The costume was made using gumpaste which was colored using paste food colors. The folds in the skirt were made by rolling out the gumpaste very thin and then squeezing the ends together on one side, then draped over her randomly. There are several layers of draping. The rough edges are covered by the tiny belt that is on her hips. Use royal icing in gold for the tiny decorations on her bra and belt. 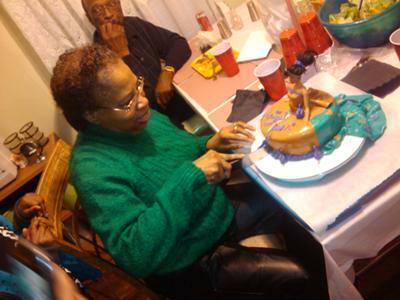 I love this story by Jushawn who made a Cinderella princess cake for her Aunt Hazel. 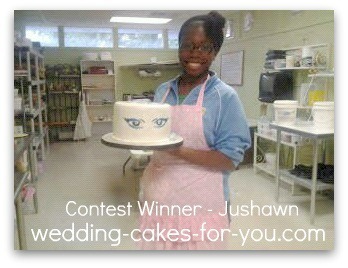 This was submitted for a contest here and Jushawn was a winner for her beautiful cake and sweet story about her Aunt. On December 28, 1947, my aunt Hazel was born. Hazel grew up living a wonderful life. Spending time with family and friends was always first. She took in her sister Gwen’s daughter as if she was her own. In 1995, her niece, I, Jushawn was born. To me, Hazel, was a strong woman. I looked up to my aunt Hazel and admired her. Fashion was also a must to Hazel. She wore the nicest dresses, the best accessories, and the cutest hats. She was looked at as Cinderella. She walked around with pride. She was a role model to many. She was what I considered a real woman. On one tragic day, she was cleaning and a mix of chemicals she was using got into her system and she was rushed into the hospital. Due to the strength of these chemicals, Hazel lost were memory, and was now considered handicapped and unable. She now spends every hour of every day in bed, and the task of getting her up and active is a hard one. The day of the incident I was actually with her. I was young and watching her carried off in an ambulance was one of my worst experiences of my life. The event affected me in the worst way possible. I had lost my role model, my friend, and most important my aunt. On her birthday, when I was asked to make her birthday cake, it was hard finding an idea or theme for the cake. 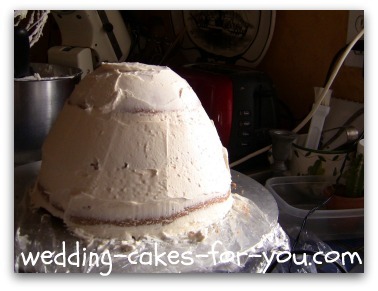 I continued to finish the basics, and after I had iced the cake and began to place the fondant, the way the fondant fell around the cake inspired me. It had me think of a wedding dress. When the picture of the dress came to mind, I instantly began to reminisce of the times I'd watch my aunt, Hazel, get dressed in her finest dresses. Those memories are what inspired me to create this cake in the design of a unique dress. Thank you Jushawn for your very touching story about your Aunt. She obviously means the world to you. Her sweet Cinderella birthday cake is beautiful and made with so much love. Hazel has been an inspiration to all she has come into contact with, whether it be as an aunt, cousin, god parent, usher, supervisor, co worker or friend. She represented the fine gkue fir keeping her family not only together but involved in each others lives. She is also one of the reasons why I have striven to become an independent contractor. She drilled the concept of career and not job into my mind. I see an energetic, outgoing, outspoken person who loved life and the newness of each day to become idle, nonchalant and with out words was devastating. Jushawn, I appreciate your tribute cake to a true Cinderella. Jushawn this was a very special cake for a very special person.. It was well put together with lots of detail. I can see that this is your passion considering the time and effort you put into this. Job well done! Beautiful job for a Beautiful lady. I am sure your Aunt Hazel is very proud of you. You can see that much Love and Admiration went into the cake. The admiration for your aunt is shared, about three years before you was born Hazel attended my wedding, and excluding myself, she was by far the best dressed woman there. She also wore the most beautiful hat. Of course I remember that day vividly; I remember her presence and appreciated her sharing that day with us. I am very sorry to hear of her illness, but I am sure her legacy of beauty and pride will continue to shine on in you and the other young people she has touched. Your family must beam with joy when they see your artistic skills used in such a loving way. You have the compassion that many of us would hope to have in our lifetime. Continue on your beautiful path of using your gifts to share with other people. I will remember the way you chose to honor your Aunt. You are not just a skilled young entrepreneur but one who truly cares to make something memorable. Jushawn, that was so loving, your love for your aunt,an the cake showed the love. I hope you continue,an go as far as you can. You will always have my support an love.The cake was lovely as well as good,That also counts. This story was very heart-warming and touching and I loved it! The cake is beautiful and I actually wanted a piece of it (smile). Great job and I am proud of you...! Love you! It was very touching to read the comments of our Aunt Hazel. You described her A-1 perfect! I feel the same as you do when speaking of how she was and it is great that she was such an impact on you (us). We will always love her and once again I am so proud of you growing up to be a "strong" young lady. The cake was awesome and wish I could have joined you guys to have a piece (smile). Continue doing well and hope to see you guys soon! Love you & take care. Great Job ! Beautiful cake ,wonderful reason, I love it. Keep it up the great work. Fabulous cake and touching story! Love it! I would love to have one of your cakes!! Keep up the good work! You are truly blessed with talent and your aunt is already so proud of you. I would love to have a sample of it and I will definitely contact you for my twin daughters or my mother on their upcoming birthday this July. I pray that you win this contest. Thanks for sharing this beautiful story with us. I wish you the best of luck! Wow!!!!Awesome. This is your cousin from down in the south of Georgia, a little, town call Cairo where your Aunt Hazel was born. You sum everything in a nut shell. She is still all that and more because God is still in control.And we all on this end Love her dearly. I am so proud of you, you are awesome. The cake looks beautiful. Keep up the good work. Couldn't have done it no other way. The story was so touching and lovely. Jushawn the cake is beautiful! Keep up the great work! Very proud of you! If I did not know any better, I would have thought that this cake was made at Publix. Great job Jushawn!. I LOVE the doll cakes -- great work! When I look at your work, I think of many famous talented artists who use their gifts to give a special experience to the world. That is what you do with your beautiful cake creations. You inspire us as we view a snapshot of the world through your eyes. I know there are great moments in your future. Enjoy them all. Coodos to this young lady for her revelation of a special relationship in her life. It wasn't about her, because this generation is all about me,me and mine, mine. It just goes to show that all our young people are not selfish. Jashawn you have my respect and I know you will go far. May YAH bless you. This tutorial shows how to make a mermaid sitting on a rock surrounded by water. 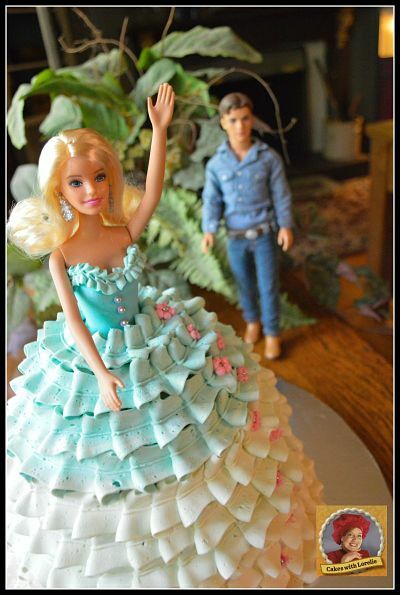 If you want to make princess cakes simply push the doll torso into the cake, eliminate the tail, and decorate the "rock" as a full Cinderella skirt. You can also eliminate the cake underneath that is used in the tutorial for the blue ocean. Gather all of your ingredients together. 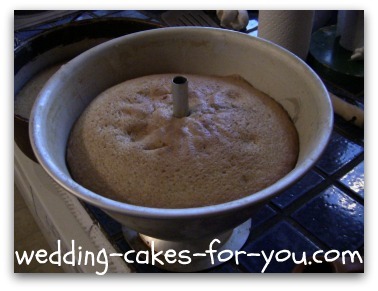 I used the yellow cake recipe on this website. Fill your pans about 2/3 full of the batter. I used a ten inch cake for a base. 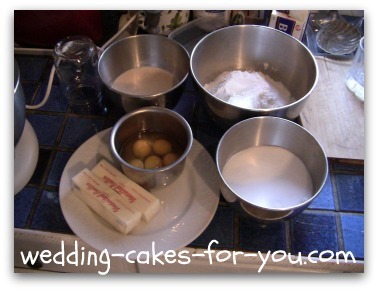 Bake your cakes until they are golden brown. You will want to bake for approximately 30 - 35 minutes. 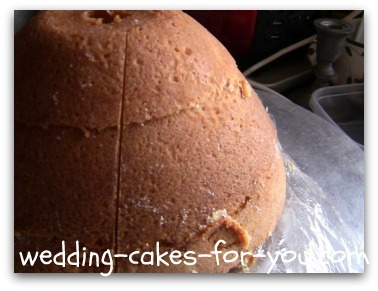 Once cooled slice the "rock" in three and then mark a vertical line on it so you can line it back up after it is filled. 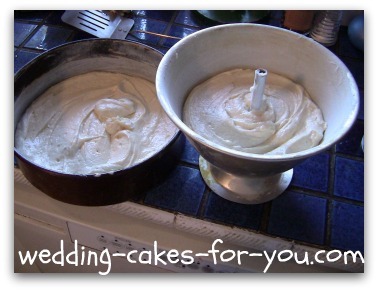 Fill the cakes with a 1 inch layer of frosting. 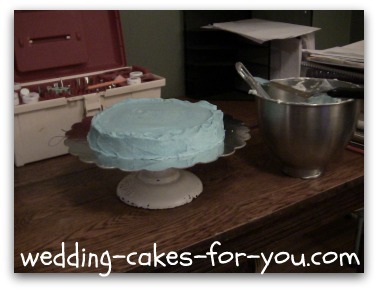 I used easy buttercream frosting recipe on this website. It is now crumb coated and ready for final frosting. 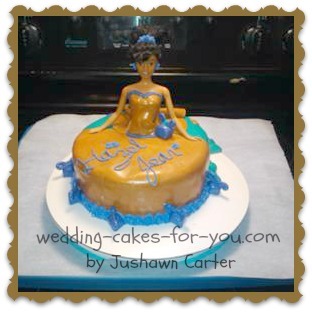 Blue frosting can be used to ice the bottom cake, It will be the water around the rock for the mermaid. 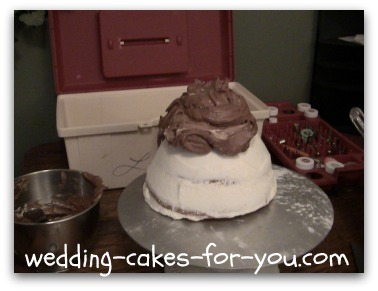 Chocolate frosting is perfect for the rock and it doesn't have to be smooth, which makes this even easier. You may then want to add some waves like I did in the pictures. Use a spatula to swirl it around. TIP: When you mix the blue coloring into the icing, do not mix it all the way, this way the waves look as if they have some sea foam. You can then add a little bit more white icing on the tips of the waves. For the tail I started forming her waist with extra chocolate pieces of cake. The doll is then pushed into the rock. 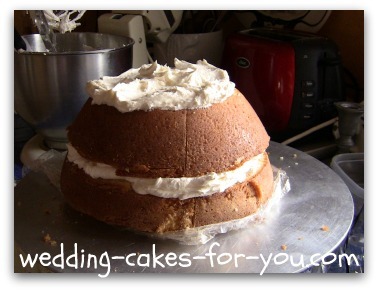 The rest of the tail is then formed trailing down the sides of the cake. Use a small leaf tip or a small rose tip to pipe the scales over the tail part. For the tail use a little bit of extra cake, cut into a fin shape. You can then use a little bit of gold highlights as I did on the tail using the pre-made Wilton gold frosting in a tube or sparkle dust. Close up of some of the details. Real seashells were used and little dots of colored icing in her hair and around her neck and arm. The bra is made using a star tip. 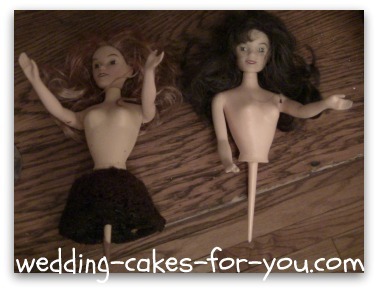 You can submit your princess cakes below and tell us a little about it. 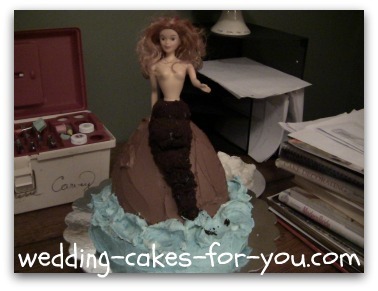 Did someone make you a barbie doll cake, Ariel cake or a little mermaid cake? You may also want to ask a question. Araceli shared her beautiful design and said a few words about it. "I actually just have a couple of months baking and decorating cakes, so it was a beautiful challenge. I made this for my daughters 6th birthday party." Another very happy birthday Goddess, Tessa, had a Bellydancer Princess too! The expressions on her little friends faces are too funny. Close up of one of the princess cakes below. 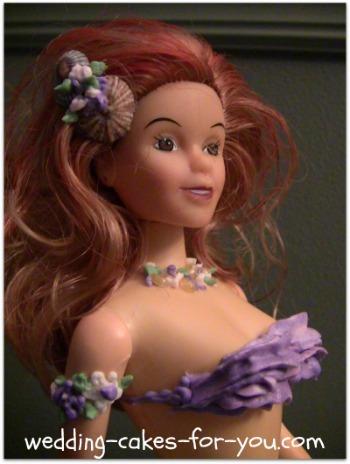 Simply pipe some icing on her for a bra top and make some drop strings for her fringe and neck piece. Check out Leslie's design. Click on the picture to read her story. 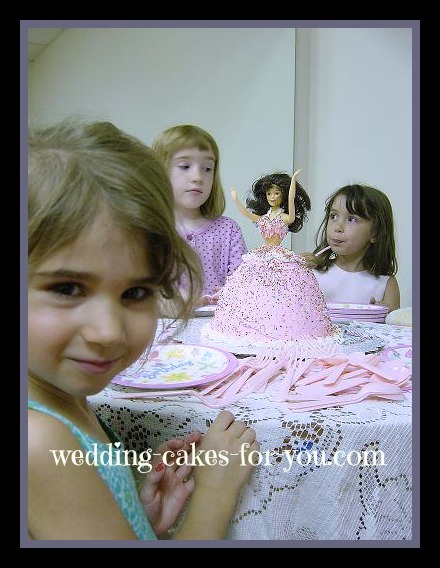 Have you made a beautiful princess or Barbie doll cake? Do you have a question about how to make one. Share it! Do you have some pictures or graphics to add? Great! Click the button and find the first one on your computer. Select it and click on the button to choose it. Then select it. Resize any photo larger than 800x600 pixels using your graphics software, such as Picasa, Paint, Adobe or a Web-based resizer, such as Picnik, SBI will take you to Picnik automatically if you want to use that one.